There are simple moments in childhood that are sometimes taken for granted; like dancing in the living room or learning to play the recorder in elementary school. For James Phillips of Durham's own Bombadil, these typical moments eventually led to a passion for music and the need to share that passion with others. Phillips chatted with The Triangle Beat about his love of music, the band's journey, and the future of Bombadil. Bombadil got started when Bryan Rahija and Daniel Michalak attended Duke University together. Their friendship started when studying abroad in Bolivia. They later added Stuart Robinson and James Phillips to create a completed four piece. While this experience sounds devastating with no silver lining, each group member managed to find a way to turn this moment into a time of growth. Michalak visited countless doctors to learn ways to mange his new condition, Phillips spent time living in Oregon, while Robinson and Rahija collaborated on new music. Eventually, the musically gifted friends found themselves working together once again and Michalak learned to control his nerve pain. In 2011, the newly bonded Bombadil gathered in a barn in Oregon to record All That the Rain Promises. This is the same Oregon barn on the Pendavavis Farm used by The Decemberists to record The King is Dead. Bombadil completed the entire recording in just eight days. Phillips states that the album, "could've been more polished, but they wanted to prove they could do it." While they don't regret recording the album this way, they did not take the rushed approached with 2013's Metrics of Affection. It was recorded in Old Durham by Phillips himself. These days, the band is working on a new album in the North Carolina area, mostly Durham and Lake Gaston. It is expected to be released around January 2015. 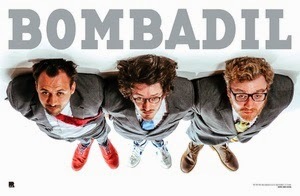 Bombadil plays on the Cat's Cradle stage this Saturday, June 21. Ramseur Records is releasing Tarpits and Canyonlands on vinyl and to celebrate, the album will be played in its entirety at Saturday's show. According to Paste Magazine, the album, "often sounds like a college glee club covering The Village Green Preservation Society: The melodies are chipper, the hooks prominent, the performances energetic, the arrangements full to bursting with ideas." Phillips calls the album, "...a young man's record" due to the fact that it "reflects a year on the road with four dudes spending too much time together." Even though Bombadil has had some roadblocks, they haven't let that slow them down. Phillips reflects on their accomplishments like playing at Hopscotch and seeing people in the crowd sing along to their songs for the first time. This band has accomplished a great deal in a short period of time with their quirky style and they don't plan on stopping anytime soon. Experience Tarpits and Canyonlands again with these hometown boys. River Whyless will get the night started at 8:30 with an appearance by DJ Neat Freak. Get tickets at the Cat's Cradle website.